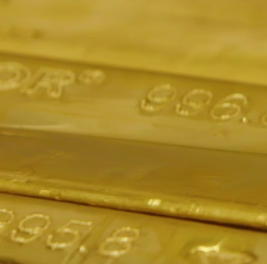 GOLD BAR prices slipped below $1310 per ounce for the 5th time in a week on Wednesday in London's wholesale market, edging down as new US inflation beat analyst forecasts and contrasted with the Federal Reserve's "cautious" outlook on needing to raise interest rates soon in 2019. Euro gold prices edged up to €1160 once more as the Euro fell steeply on the FX market, dropping 1.5 cents against the Dollar from a 3-session high overnight, after new data said industrial production across the 19-nation currency union fell 4.2% in December from a year earlier, the worst contraction since the global financial crisis of a decade ago. 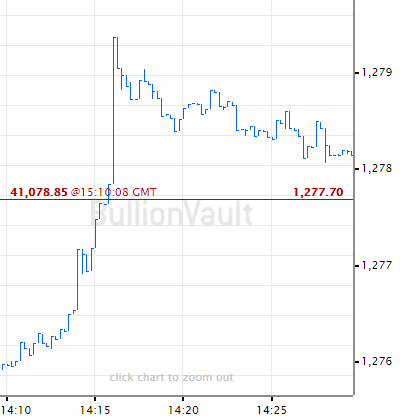 UK gold bar prices meantime held flat with last Friday's 120-week closing high of £1016 per ounce after UK inflation came in below analyst forecasts at a 2-year low of 1.8% per annum. So-called 'core' US inflation – which excludes "volatile' fuel and food costs – in contrast held near 2.2% on the latest official data. 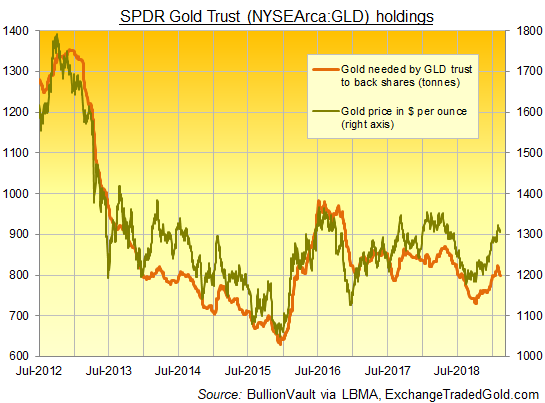 Giant gold-backed ETF the SPDR Gold Trust (NYSEArca: GLD) saw more outflows on Tuesday, and has now shrunk on 7 of this month's 8 trading days so far, with investor interest falling by 3.0% as bullion prices have held in a $20 range above $1300 per ounce. 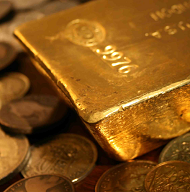 Shanghai gold prices again held above ¥287 per gram today, the 3rd session running after the wholesale market in China – the world's No.1 gold jewelry, coin and bar consumer – re-opened following last week's Lunar New Year holidays. That level marked a 21-month high for Yuan gold prices when reached in early January. Today's action kept the Shanghai premium over London gold quotes - a measure of China's domestic supply and demand balance - at $1 above the typical average of $9 per ounce. "It's hard not to come away thinking that the sudden affection for gold has something to do with the souring global economic outlook," agrees a column at Bloomberg, claiming that "gold's sending a message [by] soaring in defiance of [the] risk asset rally. "Two large Chinese borrowers missed recent payment deadlines," the column goes on, "suggesting that government efforts to smooth over cracks in [China's] $11 trillion bond market aren't benefiting all firms." Meantime in No.2 gold consumer nation India – where import duty adds 10% to bullion costs and sales tax adds another 3-5% on gold jewelry – tighter checks at airports mean "Gold smugglers have turned their attention to railway networks," says the Times of India, "[which] lack proper baggage screening mechanism." In Japan seizures of smuggled gold have risen 50-fold since VAT sales tax rose from 5% to 8% in 2014, enabling crooks to earn that extra cash back when selling gold to dealers under the country's unique "input tax credit" system. With Japan's VAT set to rise 10% this October, the Finance Ministry " plans to require buyers to make copies of sellers' I.D. documents, such as passports or driver's licenses," reports The Japan News.